Bom, depois da apresentação do Mike há pouco mais de um dia, aqui está o primeiro report da sua autoria. É referente à prova do passado sábado em Tullan (NW da Irlanda) que reuniu as duas categorias do kayaksurf (HP e IC) e o waveski. Curiosamente, Mickey venceu a categoria HP ;) Fica o report. Well, a few hours after we present the most recent element of our NEWS TEAM, here is his first report ;) Mickey summarizes us the main information about the event. 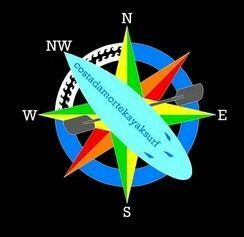 By the way, congratulations for the first place on kayaksurf HP Mickey!! 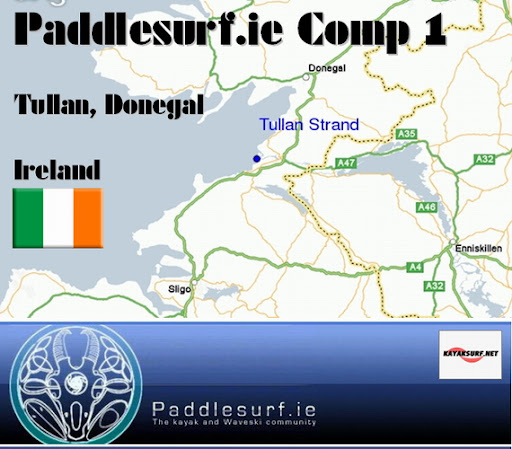 The 2011 Irish Paddlesurf year kicked off at Tullan strand with small but super clean waves. The day started early with everyone making the trip down the beach with hooters, tents, flags, waveski's, HP and IC boats. Heats, Reps and Finals all went off quickly with a noticeable improvement in surfing from all regular competitors and some great surfing from some newcomers. Even on the small waves, it can be seen people are hungry for airtime. Sunday was a training day with Waveskier Marty McCann providing tips to anyone who wanted them and giving feedback and lessons for people to take home and practice. Great weekend, good surfing and excellent training for all. Ambos são presença habitual no kayaksurf.net. Sefano Bellotti e Gabriele Dellacasa contam com o apoio, entre outros, da SURFACTIVITY e GRAVITA ZERO e, entre 18 e 20 deste mês, lá estarão uma vez mais em Santa Cruz, Califórnia. Boa sorte para os craques italianos!! They are both regular presences on kayaksurf.net. Stefano Belloti and Gabriele Dellacasa have the support, among others, from SURFACTIVITY and GRAVITA ZERO. From 18th till 20th of this month, they will be once more in California for one more Santa Cruz Festival. Good luck for the Italian Squad!! É o mais recente elemento da nossa NEWS TEAM! Directamente da Irlanda, Mickey Barry. Mais um apaixonado pelas pagaias e ondas. 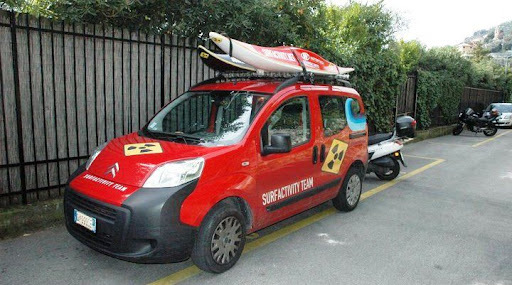 Mickey já colaborava connosco há vários anos mas agora, "oficializámos" a sua entrada para a equipa de notícias mais poderosa do mundo do kayaksurf e waveski. Fica o perfil do Mickey mais em baixo. It's the most recent collaboration for our magnificent NEWS TEAM ;) Micky Barry already contributed with kayaksurf.net a few years ago and now, we formalize his entry to the most powerfull kayaksurf & waveski worldwide NEWS TEAM ;) Mickey lives in Ireland and you can check below his profile. THANKS and welcolme Mickey!! Random Evolution, Mega Trident, Wavesport boats for freshwater fun( Project X, Deisel 80 )+ Gath Gedi Helmet + AT Paddles are on the way, currently Werner Sidekicks / PeakUK Cag, BA, Booties. 1st Kayak Intervarsity's Rodeo '04, '05. 1st Limerick Riverfest Big Air Ramp '06. 1st Limerick Riverfest X-pression Session '07. Organiser of several succesful Freestyle and Boater X comps. Quando Mathieu Babarit vem a Portugal, faz as delícias de fotógrafos e amantes da modalidade com o seu surf de luxo. Para além do multi-campeão mundial, uma nova geração está a despontar no waveski francês. Ainda na passada semana estivemos a observar a Octopus em acção nas ondas de Peniche, e lá estavam vários jovens a treinar sob orientação de Matt. Fred Jonneaux, NEWS TEAM kayaksurf.net, ajuda-nos a perceber melhor este fenómeno do waveski em França. É que, para além desta formação "privada", algumas escolas "públicas" têm desenvolvido um trabalho fantástico. Como a de Sables d'Olonne. Fica o report de Fred. Muito bom. 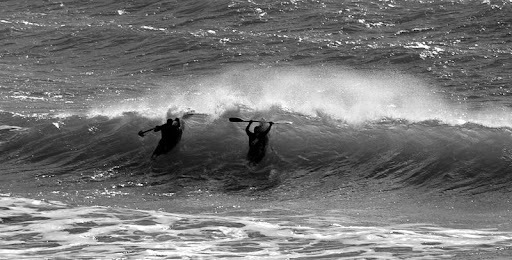 Fred Jonneaux, NEWS TEAM kayaksurf.net, presents us the great work that the Section Sportive du lycée Savary de Mauléon, Sables D'Olonne, has been done for the waveski scene in France. 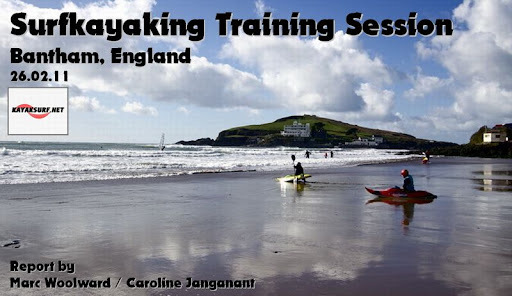 It's a special school, with waveski training during the school time. Young riders from 15 to 19 years old can go in this school. Great riders as Caroline Angibaud, Coralie Jousset, Renan Leloutre, etc... were in this school. See below the description of Fred and on the top, the video produced by Mathieu Jonneaux. It's opened to young riders, from 15 to 19 years old. There is only 7 places on waveski class, and to get there the students must have a good level in school work, first, because it's the most important, and be competitors in waveski activity. There are also several other sport classes in this school, as : surf, beach volley, sailing boat. The riders have 3 training sessions during the week, and one more on the week-end. Also, they have a special place very close to the beach, where they have their boards, in a locked garage. They all have their own key, and can go there for a short session at any time out of school time (it's 5 mn away by bike from the school). The waveski coach is Gérard Lucas, who was one of the first french waveski world champion, and has been coaching the French National Waveski Team for a long time in the 90's, and until 2003 (I'm not sure about 2003). 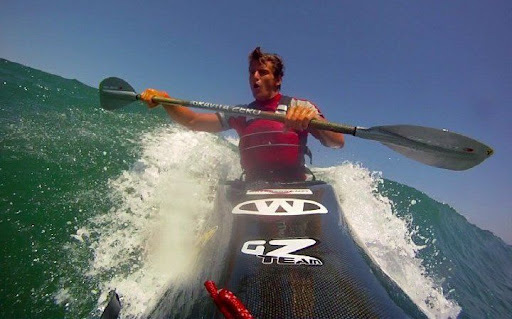 Mathieu Babarit was also a coach and not training in this school, the waveski school was created in 2000 and Mathieu was not anymore at school. Then, before he created Octopus School, he worked for several years as waveski coach for this school. I think this is a very good way for riders to get a very good level in waveski, because they can go in the water almost every day, and teachers make sure they do their best at school to build their future. At the same time, every waveski rider in France hear about this school, and this is probably one of the reasons we have so many young riders, with very good level. 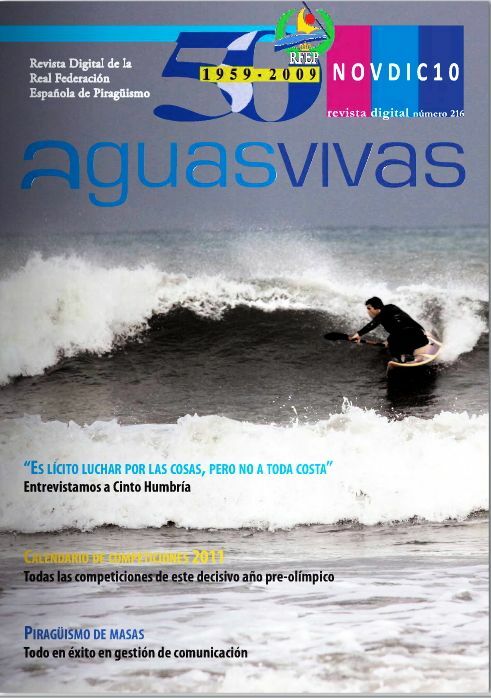 Alex Moure, Club Kayaksurf Galicia, na capa da "Aguas Vivas"
A Revista Digital da Real Federación Española de Piraguismo, elegeu o excelente trabalho que o Club Kayaksurf Galicia está a desenvolver pelo kayaksurf e waveski em Espanha e promoveu uma foto de um dos seus atletas na capa. Alex Moure, fotografado por Esther Otero, na edição nº 126. Parabéns CKSG! 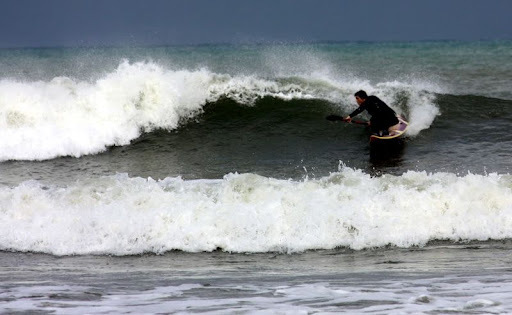 The digital magazine of the "Real Federación Española de Piraguismo" (spanish paddling federation), just elected one of the Club Kayaksurf Galicia ahletes to the cover of his latest number. It's just the recognition of the great work that this club has been done for the kayaksurf and waveski scene in Galicia, Spain. Congratulations for Alex Moure (in the photo) and also for CKSG! 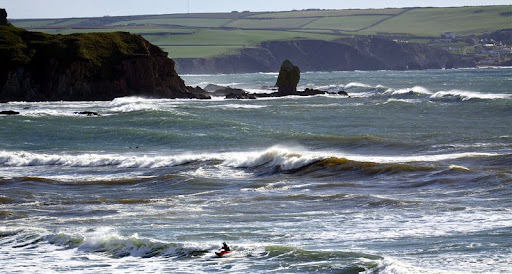 A surfada decorreu no passado fim de semana em Bantham (Devon, England), e juntou vários craques nas ondas, A swell não ajudou muito mas a diversão reinou. Fica o report de Marc e Carol - NEWS TEAM kayaksurf.net. It's been a long, hard winter. Haven't made it out West for months due to work commitments, bad bad weather, and sickness. So when the chance to get out there came along this weekend we grabbed it despite the poor forecast. 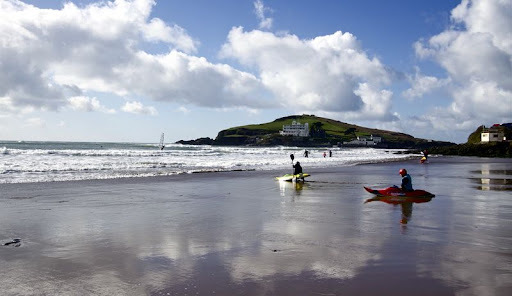 The Storm Front battering the North Coast made it unsurfable so a few text messages and a bunch of us were heading for Bantham on the southcoast of Devon. As we got there, the storm passed and the sun came out and despite howling cross-shore winds and small swell it was a fun session. Always is when you're surfing with friends. Interpretation by Caroline Janganant. Paddlers - 2 World Champions and a bunch of ne'er do wells. Chris Hobson, David Speller, Chris Jones, Denzil Pearce, Pete Blenkinson, and me (Marc Woolward). Dessie McGlinchey conta com mais um apoio - parabéns Dessie! Dessie McGlinchey, NEWS TEAM kayaksurf.net, conta com mais um apoio. Para além da GATH, a Lendal patrocina igualmente o atleta da selecção norte-irlandesa de kayaksurf. Nada de mais. 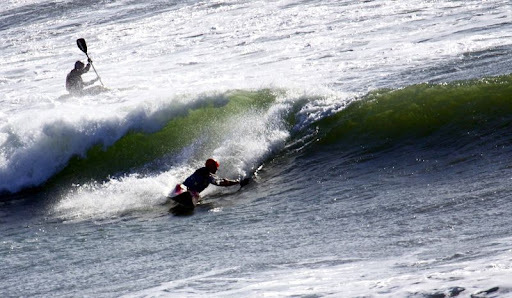 Dessie tem desenvolvido um excelente trabalho em prol da modalidade e, para além dos habituais vídeos que produz, continua com as suas actividades de formação no clube da CANISURF. Isto, claro, sem contar com o seu currículo desportivo de luxo ;) Parabéns Dessie! 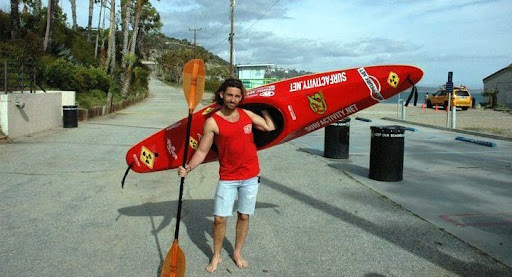 Dessie McGlinchey, NEWS TEAM kayaksurf.net, has one more support. Besides GATH, Lendal paddles will also sponsors him. That's simply the recognition of the great work that Dessie has done for northern ireland surflkayaking for several years. 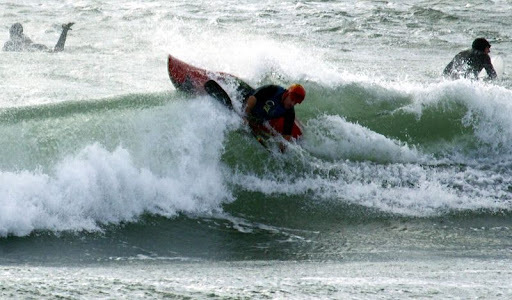 Besides being an awesome surfer, Dessie also contributes in training for NI surfkayak. Congratulations Dessie and continues the good work. Lendal is proud and delighted to renew Sponsorship with Dessie McGlinchey, Level 5 surf coach from Northern Ireland. We hope to work closely with Dessie to test and develop our blades and paddles to the optimum performance standard. Dessie paddles both classes in comps and has achieved best results in the International Class but also enjoys paddling the short finned boat. Dessie is gained status as a Level 5 Surf Coach in 2003 and has been involved in coaching the Northern Ireland Surf Squad since 2002. The squad has achieved some great results in the individual events at the highest levels. Team paddlers have achieved World, European, British and Irish titles in both Senior and Junior level since 2004. “Welcome on board the Team Dessie”. Bem, estamos a falar de uma das líderes mundiais de equipamento para canoagem. Pagaias, kayaks, coletes, saiotes, pranchas de SUP, etc. O kayaksurf.net orgulha-se de contar com a colaboração da ROBSON há vários anos e aqui fica o convite para uma espreitadela ao catálogo para este ano. Basta CLICAR na imagem de cima. Luxo!! 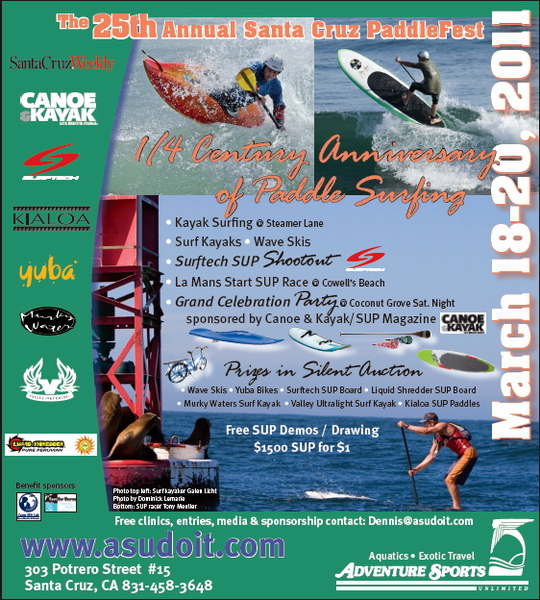 Well, we're speaking of one of the TOP worldwide brands about paddling equipment. Made in Germany for the world, you can choose from ROBSON whatever you need: paddles, kayaks, PFD's, spraydecks, fins, stand up boards, etc. 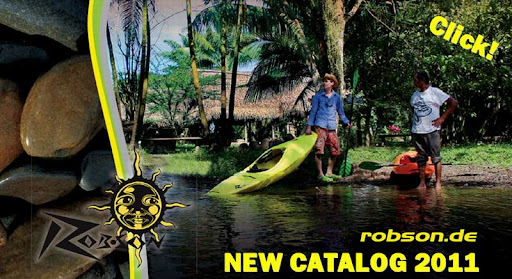 We proudly collaborate with ROBSON several years ago and now, we invite you all to check this year catalog. It's simply amazing! CLICK on the TOP image and go!